You know those advertisements for races for various causes? The ones where happy participants in a 10K race bravely declare to the cameras: “I’m doing it for my mom/sister/brother/father/partner”? Let me explain. Shabbat is an island of stillness in a week of frenetic movement, a respite in the madness of our culture’s obsession with consuming, creating, spending, making, and doing. Shabbat is a day of simply, gloriously, and beautifully just being. We are, after all, human beings, not human doings. I’d like to say that I live by the codes of goodness, simplicity, acts of charity, and patience for my high needs children. Even though I want to believe that I live for those things and those things only, what mostly goes on during the week is emails, Facebook, and scheduling both playdates and show business appointments and press, and the occasional gchat session. Okay, more than occasional. Anyway. This all boils down to my relationship with my Blackberry. I am truly bonded and enthralled with that piece of amazing technology that I can take anywhere, use anywhere, and that transforms every mall bathroom, car ride, and walk down the street into my work station. Oh, how I love that Blackberry! On Shabbat, I make a 25 hour commitment to shut it all down and bring it all to a halt. Sometimes it’s a screeching halt, and the clash of the life of my crazy busy hectic week with the stillness of Shabbat can feel scary and intimidating and so darn… quiet. Friday nights pass relatively easily, though, since we go straight from shutting it all down to lighting it all up with candles and blessing our kids and a nice big meal. It’s on Saturday mornings that I get my first reminder that it’s really Shabbat. I can’t hit that little delicious little power button on my laptop or turn on my Blackberry to see who wants me, needs me, or loves me (what, is that weird to say!?) and I get to just be with my kids. I make them breakfast and settle down to play with them. Really play with them. No interruptions, no excuses. My focus is on the present; no email to check, no gchats to keep up with, and nothing more important than seeing what the world can be like without those distractions. Sometimes we walk to Temple (the closest one is a 45 minute walk), but usually we stay home and have guests over for lunch. Sometimes I nap and we play some more and then eat the third meal of Shabbat before bedtime. On Shabbat, I make special treats like vegan onion dip (party!) and vegan white flour challah (look out now!) and sometimes I don’t even insist that my boys eat more than challah and grape juice (I know, call Child Protective Services). In the seasons when daylight savings allows our kids to experience the end of Shabbat before it’s bedtime, we fire up an elaborately braided Havdallah candle and let the boys witness the separation Jews honor between the sacredness of Shabbat and the rest of the week. We sing Eliyahu HaNavi and we sing it like we mean it. And when I spot three stars appear in the nighttime sky, a gazing which always brings me to tears–how many Jews have done exactly what I am doing now? !–I take a deep breath and I hit that power button. I fire up the Blackberry and I reenter the world of doing until the next Shabbat, when I shut it all down all over again. I didn’t grow up observing the Sabbath and I am still working on understanding the best ways to implement a Shabbat experience in accordance with Jewish Law that works for our family. But I know that Shabbat gives me and my kids a tremendous gift: the gift of me existing for 25 hours unable to say, “In a minute,” “Not now,” “Let me check my email,” or “After I post this on Facebook.” That gift is truly a blessing; one that I work hard for every week. And it’s a blessing that I forget to value, and I am grateful–infinitely grateful to get to renew that blessing every week until I get it right. 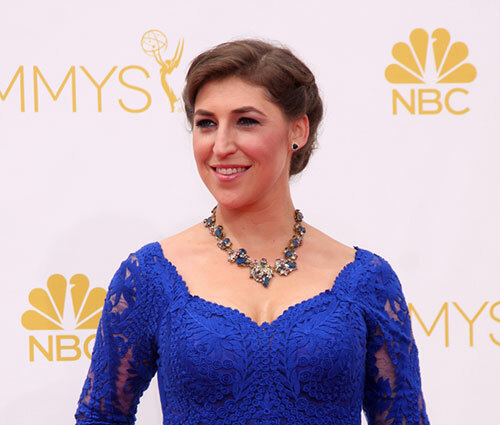 Want more Mayim? Read about her take on breastfeeding, Legoland, Perez Hilton, and Chelsea Handler.